Stem cells are subjected to many processes and fates. They can self-renew in symmetrical or asymmetrical divisions, become quiescent, differentiate, leave the niche, or even die by apoptosis. All of these processes are tightly controlled by internal and external signals to ensure expansion or maintenance of the stem cell pool and supply of newborn stem cells. 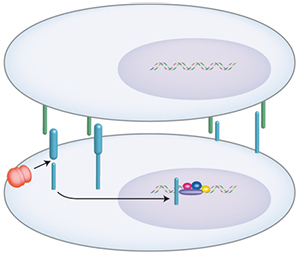 A number of signaling pathways including Notch, Wnt, MAPK, Akt and SMAD pathways have been shown to be involved in regulating stem cell fate. 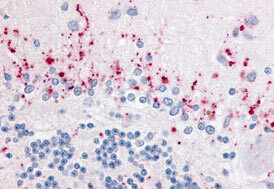 Staining of formalin fixed, paraffin embedded human cerebellum with Rabbit Anti-Human WNT28 (AHP1136). Manipulation of signaling pathways is also critical in reprograming cells to form induced pluripotent stem cells. Bio-Rad provides a broad collection of stem cell antibodies guaranteed for use in key applications such as flow cytometry and western blotting. Click on the related links below to explore our product range by marker or use the filters in the table below to sort the attributes in order to find the antibody that fits your exact requirements. Blank U et al. (2008). Signaling pathways governing stem-cell fate. Blood 111, 492-503. Dalton S (2013). Signaling networks in human pluripotent stem cells. Curr Opin Cell Biol 25, 241-246. Gama-Norton L et al. (2015). Notch signal strength controls cell fate in the haemogenic endothelium. Nature Comms 6, 8510. Hawkins K et al. (2014). Cell signaling pathways underlying induced pluripotent stem cell reprogramming. World J Stem Cells 6, 620-628. Jaisawal R K et al. (1999). (Adult Human Mesenchymal Stem Cell Differentiation to the Osteogenic or Adipogenic Lineage Is Regulated by Mitogen-activated Protein Kinase. JBC 275, 9645-9652. Katoh M and Katoh M (2007). WNT Signaling Pathway and Stem Cell Signaling Network. Molecular Pathways 13, 4042-4045. Romorini L et al. (2016). AKT/GSK3β signaling pathway is critically involved in human pluripotent stem cell survival. Scientific Reports 6, 35660.